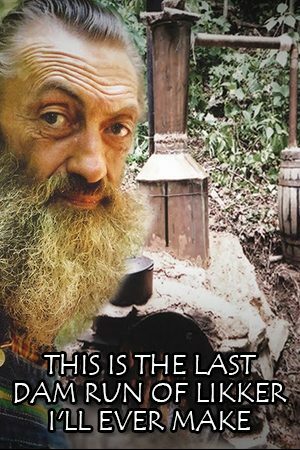 This film follows Marvin “Popcorn” Sutton— an American legend, a true mountain man best known for his moonshine. He was born and raised in Maggie Valley, North Carolina. The film begins while Sutton searches for a good spot to prepare his liquor one last time. He finds a few good places that are out of sight and that nobody can find easily. The place must have a stream with clean cold water where he can set up a still and prepare his secret formula. The main ingredients he uses are corn, malt, and sugar. Because it’s summer time, the product should be ready in about five days. Popcorn finally finds a spot that has all the requirements and immediately begins setting up his moonshine shack. The still takes a few hours of building until every single piece is securely in the right spot. When asked if somebody ever taught him to do what he does, his answer is that the only way to learn anything is by doing it yourself. Sutton uses his bare hands to secure the barrels in place using rocks and mud. As he works he explains that the only reason why he’s doing this again is for the film so people can see how it used to be done. He talks about how difficult it was to prepare liquor just a few decades before, and states that he was turned in once and he hopes that whoever betrayed him may be resting in hell. This bootlegger’s liquor was in such high demand that people were willing to barter for it or pay what was then considered huge sums of money just for a jar. According to Sutton it’s really hard to come by good moonshine these days because nobody is willing to work so hard as is necessary to produce a good product. Popcorn thinks that he’s one of the last moonshiners left and he doesn’t plan to continue the tradition after this. By the following day, Popcorn and his companion J.B. are done setting up all the equipment. As he takes a break he talks about how he started smoking and drinking when he was only six years old. Popcorn doesn’t believe that smoking and drinking can kill people and he doesn’t expect to have a long life anyway. Popcorn shares his wisdom and his worldview in an authentic and uncomplicated way. He talks about the four things he has in this world that he doesn’t allow anybody to mess with: his old lady, his A Model Ford, his liquor business, and his six cats. Watch this film now.